“Library infographics presented below clearly show that being a librarian today is not about surviving any longer. It’s great that such infographics are created. Infographics are a fantastic way to draw attention of online users, and give facts not only in a more digestible, but also highly entertaining way. Many people still perceive libraries as awesome-looking magical places, full of a scent of old paper. We associate libraries with the past and with the analog world – the world that doesn’t fit into broadband internet connection. It’s not true (and I think it never was). More and more libraries lend electronic books, become information hubs, but most importantly, media creation centers. These infographics change the perspective. They show the beautiful book temples are filled not only with the past, but also with the future. Click or tap on the infographics to enlarge them. This interesting infographic lists most important reasons why you need a librarian in an internet age more than ever before. Nowadays, what we mostly struggle with is the information overload, not a lack of it. The librarian can be your guide to the digital world. And there is a special word for that: a cybrarian. According to Merriam-Webster Dictionary, a cybrarian is “a person whose job is to find, collect, and manage information that is available on the World Wide Web”. 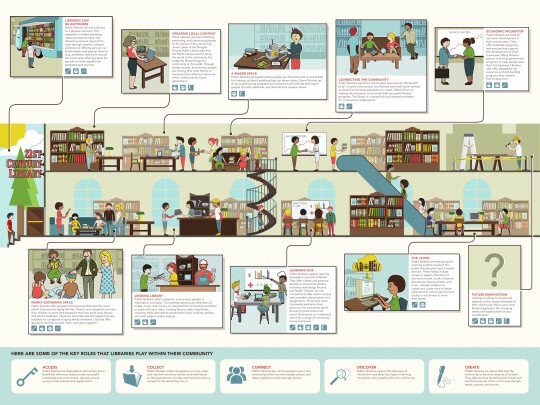 Librarians from California State Library have developed a smart infographic that in a form of a cartoon analyzes all the possible roles a public library can take in the coming years and decades. University of South California developed the infographic interesting not only for those who plan their future with libraries, but for anyone who cares about the future of libraries. You’ll find here a comparison of salaries of library stuff, depending on specialization. The infographic includes also interesting findings about how smartphones and e-readers can influence the evolution of libraries. Larry Cooperman, a faculty librarian at the University of Central Florida, has prepared a great infographic that will let you find out whether you will make a successful solo librarian. The visual is, in fact, a checklist of major areas of competence, including change management, marketing, and information technology. If I had to name one single infographic that encourages online audience to visit and support libraries, I’d point to this one, developed by StateStats. Well researched and designed, the infographic is a complete list of facts and figures needed to picture the libraries and their importance in our times. Most of all, the data included in the chart supports one clear call to action: help the library in your neighborhood! Getting a library card and regularly borrowing books, in every possible form, is more than enough. While most of the library infographics provide information on a national or global level, we’ve recently spotted a new trend – potentially something really big. 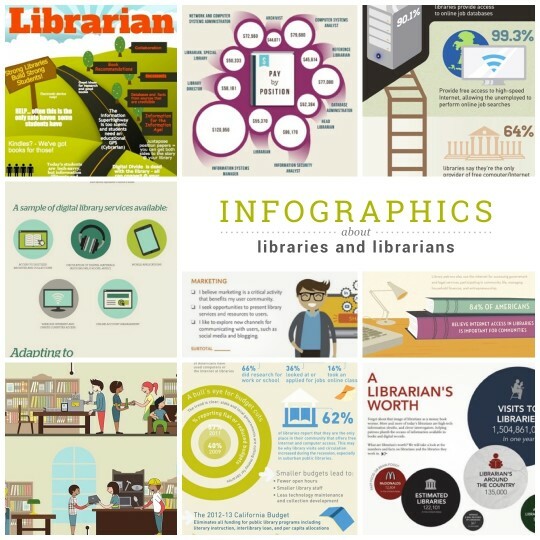 More and more individual libraries create their own infographics. Using free online infographic creators like Pikochart or Infogram, library workers put together the data specific to their very own library temple. Suddenly, instead of vague images, the numbers make us see something very specific: library patrons between the shelves of the closest library. The example above is one of the nicest and smartest we’ve seen so far. It presents fun facts about the McGill Library, Montreal, Canada. Nowadays, being a librarian is not about surviving any more. It’s about new challenges, new areas of competence, new possibilities. Nowadays, the skilled librarian is needed more than ever before. The infographic, published by the University of Southern California, Online Library Science Degree, and Creative Signals, shows how the role of the librarian evolves. With the rise of digitized archives, and new technology to access and process them, the library transforms to a space not only of media consumption, but also of media creation. Libraries adapt to new reality much better than anyone could think. The key to win in the digital times is engaging communities. And realizing that libraries are not only about lending books. The world we live now is changing fast… too fast. We move from desktop computers to mobile devices. Smartphones become the default tool to get information. The information is now portable, participatory, and personal. In times of information overload, what we need more than a result, is a relevant result. And it’s where libraries become extremely useful. A librarian of the future will help an information consumer sort through available information, and find what is relevant to individual needs. 99% of public libraries in the US offer free internet to their communities. 1 in 3 Americans use libraries for that purpose. That’s a lot and can only change for the better, as 84% of US citizens believe a free internet access offered by libraries is very important for local communities. But what is needed is funding, to help libraries maintain – and improve – the quality of their services. This infographic developed for the Bill & Melinda Gates Foundation teaches ut two things: that libraries are highly focused on providing new means for education; and that this area needs support from all of us. 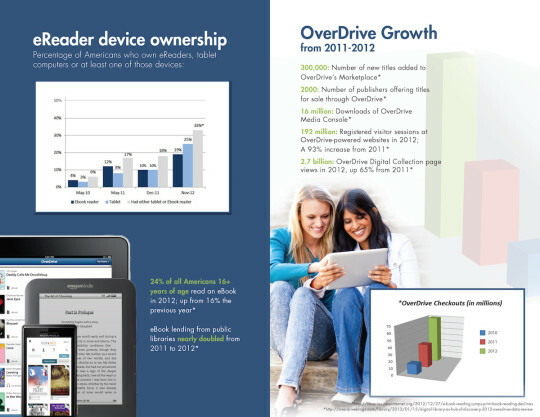 OverDrive is the leading global distributor of ebooks, audiobooks, music and video. The company currently hosts more than 1 million digital titles from more than 2,000 publishers. The content from OverDrive is powering more than 22,000 libraries, schools, and colleges around the world. More and more readers find out that their nearest library is offering a growing catalog of ebook titles, and the only thing they need to have to check out the ebook is a valid library card. This great infographic, created by Masters in Education and ObizMedia, gives a lot of new light on the role of libraries and librarians, as it changes a reference point totally. What if we compared libraries to Amazon? Each day in US public libraries more items are circulated than on Amazon. Public library cardholders outnumber registered Amazon customers by, take your breath, five to one! What’s more, librarians answer about 7.2 million questions weekly. What would we do without librarians? There is only one answer to this question: nothing. What’s the future of libraries, and how libraries of the future will look like? This great infographic from Open Site clearly show the path: there is a huge demand for technology from library patrons. 7 in 10 libraries have reported an increased usage of computers. The bottle neck is that there are not enough computers – 76% of libraries say they don’t have enough computers to meet demand. The question of library funding comes again. Librarians are the help and the search engine for all things related to written word. The form and format of the book is not the most important factor. It’s the idea behind the infographic from Teaching Degree, based on this year’s study from Pew Internet & American Life Project. Many ebook infographics are based on this specific study. The thing is what is the message. And the take away from “Libraries are forever” infographic is simple: nothing beats the good book. Electronic or print – it doesn’t really matter. What really matters is to find the good book. In this matter, you can always count on the librarian. This wonderful infographic was created by University of Southern California, and is based on a famous theory called Five laws of library science. The rules were formulated by Dr. Shiyali Ramamrita Ranganathan, a university librarian and professor of library science from India. They set up the principles of operating a library system.